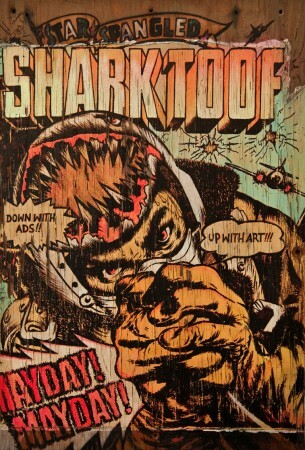 SHARK TOOF takes an in-depth look at the ambitious and versatile street artist Shark Toof, best known for his emblematic visual calling card: a wheat pasted, hand drawn shark head, which the artist describes as the “perfect culmination of all my angst, protest, strength and optimism.” Like a graffiti tag, Shark Toof has established the image as a kind of logo, deeply synonymous with the spirit and subtext of his body of work. Calling to mind the fictionalized and fantastic stylized gore of old horror movies or underground comix, Shark Toof’s apocalyptic world is graced with a sublime and dark beauty. 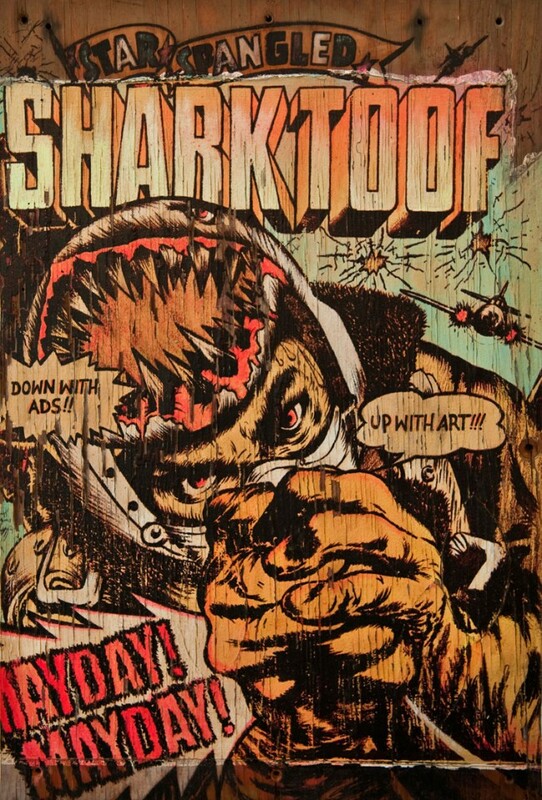 Using acrylic, spray paint, and house paint on distressed or reclaimed wood, Shark Toof’s bold, brash lines conveys a kind of frenzied, graphic energy and chiaroscuro reminiscent of German Expressionism wood block prints and graphic pulp novels alike.